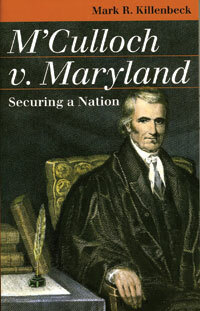 In M’Culloch v. Maryland: Securing a Nation law professor Mark Killenbeck explains why the Supreme Court’s controversial decision in the landmark 1819 case defined the nature and scope of federal authority and its relationship to the states. In M’Culloch v. Maryland, the Supreme Court decided that Congress had the authority to create the Second Bank of the United States, and states could not interfere with the bank’s activities by taxing notes issued by the bank. The decision authorized the federal government to exercise powers not expressly articulated in the Constitution and laid the foundation for a debate that continues more than 150 years after the bank ceased to exist. The case established parameters for judicial review by the Supreme Court and confirmed that the court would play an important role in the political process. It also demonstrated that the powers of the federal government are limited but supreme. This book recounts the evolution of the Constitution as a viable, governing document and presents M’Culloch as a turning point for the Constitution, the court and the nation.